The Band Pull (Dowel) Exercise is a great way to build strength and stability in your upper back, core and hips. The Band Pull (Dowel) Exercise forms part of the Golf Stability series of innovative and dynamic exercises that will build stability in your joints and core for better consistency and ball-striking. 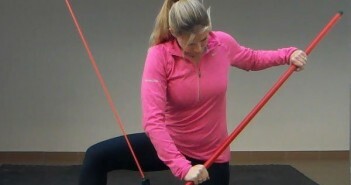 This exercise requires a resistance band or tubing, connected to one end of a dowel. Alternatively, you could use a cable machine with a stability bar or rope attachment. A broom handle makes a suitable dowel, ideally with a strong hook on one end that can be used to attach the band. It is possible to just hold the band against the dowel with your hand. Alternatively, you could use a piece of rope and hold it taught. Connect a dowel to a resistance band that is anchored at about waist-height in front of you. 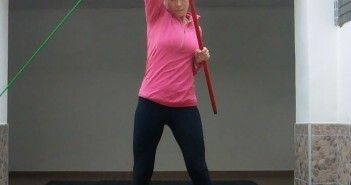 Start by standing, hinged at the hips, your knees slightly bent, holding a the dowel at arms length in front of you with a wide grip, the band connected to the right end of the dowel. Switch the dowel so the left end is connected to the band, and repeat by pulling with your left hand.